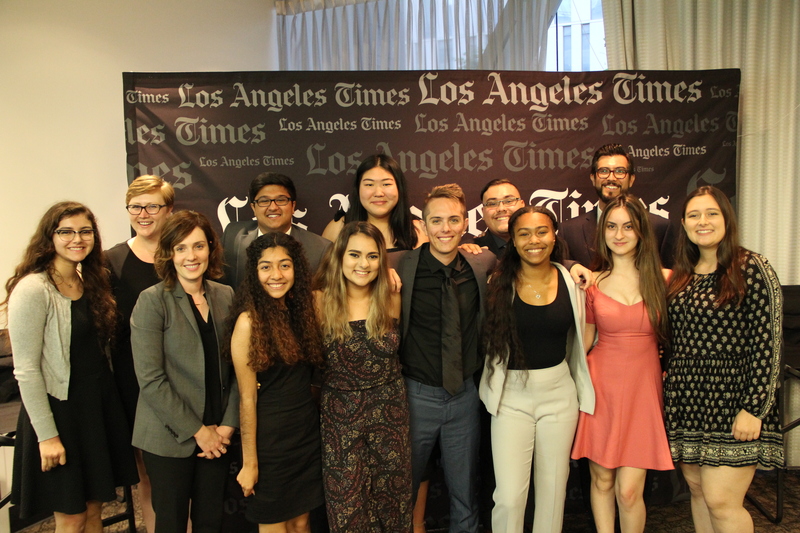 This summer, the Los Angeles Times HS Insider, in partnership with the City of Los Angeles Department of Cultural Affairs, the LA84 Foundation and the Jack Smith Foundation, will offer a select number of paid internships that will focus on arts, sports and their impact in the community. Applications are due no later than 11:59 p.m. Pacific Standard Time on Sunday, April 28. The summer internship program is open to all high school students and grade levels. The program runs for six weeks from mid-June to early August. Interns will be paid $14.25 an hour. Students will be responsible for transportation to and from the Times’ office in El Segundo. The program will run four days a week. Weekly and hourly scheduling will vary depending on what interns are covering but will not be longer than eight hours on any given day. HS Insider will make every effort to keep work hours from 9 a.m. to 6 p.m., with a one-hour lunch break. There will be additional optional reporting opportunities that interns can take advantage of during the summer. Times’ reporters and a dedicated Jack Smith Community Engagement Fellow will provide direct mentorship. Through their work on the arts, sports and their community, interns will learn about the important economic and social roles that the arts and athletics play, and how our city’s greatest strengths and biggest challenges can often be viewed through a creative, athletic or community lens. Interns will complete a Jack Smith Enterprise Story over the course of the summer with guidance from their mentor and the editorial fellow. Applicants must pitch their community story as part of the application (specific details below). Present their work to a larger audience. To further get a sense of the internship program, please review the 2018 summer interns’ work. While arts, sports and community will be the main focuses of the summer program, there will be ample opportunities to work with reporters and editors in the newsroom in other areas as well. Interns will travel outside the office on assignment, participate in conversations with senior leadership of the Times and have the opportunity to learn the history and inner workings of the Times. We are looking for interns who have a demonstrated passion for storytelling, and who are eager to learn and develop new skills. Jack Smith’s column ran in the LA Times for 37 years, giving readers, as Charlton Heston remarked “the sense and rhythm of Los Angeles… Funny when he wanted to be, easy and generous always, Jack made me understand Los Angeles.” He combined a strong journalistic foundation with a unique voice that gave readers insights into their city. As a columnist, Smith told stories of small, often overlooked, elements of the city, weaving them into a larger meaning of what it meant to be an Angeleno. Your task is to pitch your Jack Smith Enterprise Story. Find something in your neighborhood that would be overlooked by the average person, but that is crucial to the spirit of your neighborhood and that helps a reader understand Los Angeles or Southern California. It could be the graffiti on a local Metro Stop, an old theatre, a skate park, a food stand, to name a few. You must be able to cover this story over the summer (i.e. a school dance team that only meets and performs during the academic year will not work). To be clear, you do not have to produce the story as part of your application, you only need to pitch it. If you need help thinking of examples, you can view the 2018 interns’ enterprise stories here. A detailed description of the community element or thing you want to cover. A thought-through connection between your community element and the city at large (i.e. how does this graffiti help us better understand Los Angeles?). A list of 3-5 people you will interview for your story. You do not have to actually interview them now, but you must think through who you want to interview and what they will add. How you plan to tell your enterprise story. A quality enterprise story will include two of the following elements: written, video, audio, photography. Please complete the application below and submit your application no later than 11:59 p.m. Pacific Standard Time on Sunday, April 28. You will be notified of your application status on or around Friday, May 24. Please be prepared for a short interview in early May. Please contact Molly Heber a Molly.heber@latimes.com with any questions or submit them below in the comments section. What weeks are you available to work between June 17 and August 9? The program is flexible, but we ask that you be available to work at least six weeks during that time. Be sure to ask your parents about any family obligations. Are there any otherwise normal work hours (9-6 p.m.) that you cannot work (for example: summer school, camp or vacations)? Tell us why you want to be a HS Insider summer intern this year. What would you like to learn from the experience? What do you think you could add to our intern team and the Times? (2500-character ~400 word maximum). Please pitch your Jack Smith Enterprise Story (4,000 characters with spaces ~500 word maximum).